fatBuzz: Social Media Podcast No.49 - Remember When Facebook's share price was $38, now it's almost half but they have 1 billion users! Social Media Podcast No.49 - Remember When Facebook's share price was $38, now it's almost half but they have 1 billion users! We're back with Social Media Podcast No.49 and it's a slightly different line up from usual, Kyle had to take care of some urgent client work but we are joined by a couple of first-timers on the podcast. Taking part in Social Media Podcast Episode 49 we have Gordon White, Iain Murray Derek Howie and Joanna Robb. As usual, we have some lively debate and chat around the world of social media and we bring you some useful examples of social media campaigns that have gone well, and some that have not gone so well. 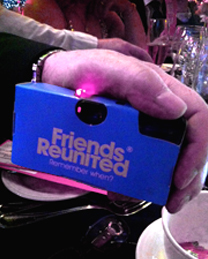 One of the things we discuss is the Friends Reunited #RememberWhen campaign run at a recent charity ball when they used disposable cameras and a hashtag to engage people both on the night and, on the Friends Reunited platform. Here is a picture of the Friends Reunited cameras that were used at the Cash for Kids Ball which ultimately raised £250,000 ($403,000) for charity. We would really welcome as many comments and contributions as possible so please send them to us as soon as possible. Podcast No.49 is packed with great conversation and information from the world of social media - there's also the normal banter and light hearted fun you expect when the Social Media Podcast team get together. Audi's ProgressIs campaign - What lessons can we learn from the competition and the two finalists, John Garcia and Jet Set Brunette? The fatBuzz Training Day for charities, oversubscribed but we may have some good news for the charities on the waiting list! iPhone 5 - Leaves its mark, but is it different enough? Will Microsoft's phone be the next big player? Iain's a finalist in the National Geographic Photographic Competition - does he need our votes? Bing teams up with Klout - are these 'scoring' sites of any real value? Social analytics tools - are they an expensive luxury? ROI - Are your expectations and goals realistic? Facebook also loses a clients' Facebook page and they wont respond to us - is the real price of 'free'? TV hit series, Once Upon a Time's Fan Club adopt With Kids as a their Charity and raise lots of money online after watching a video of Robert Carlyle on YouTube. We discuss the global donations for this small but worth while Glasgow charity. Facebook pass 1 billion users but are more than half their users still frustrated with Facebook's mobile experience? Pinterest - great for certain brands but are people realising the potential?